We were thrilled to have Judge Glenda Hatchett speak to our group. Judge Hatchett shared her experiences as the highest-ranking woman of color at Delta Air Lines, the first African-American Chief Presiding Judge of a state court in Georgia, her work on various corporate boards, and even her elementary school education in Georgia's segregated public schools to teach the lawyers in attendance about making their own success stories despite whatever circumstances they may come from, what obstacles they may have faced, or how others may view them. 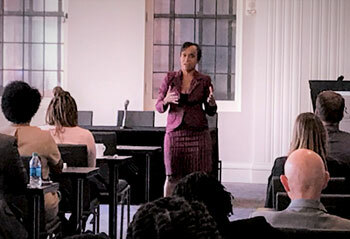 Judge Hatchett's inspiring talk helped to guide lawyers of all backgrounds to constantly strive to achieve the highest and best they can be in their profession. This panel discussion moderated by Judge Hatchett featured several successful women of color who have all carved their own path to success at major law firms, in-house positions, and in academia. 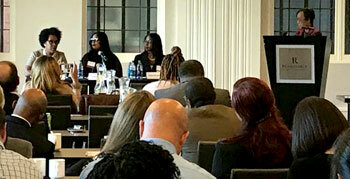 A panel made up of Magistrate Judges from the United States District Court for the Southern District of Ohio and a judge for the Hamilton County Court of Common Pleas discussed the initiative being undertaken by the Southern District to give new lawyers more opportunities to gain valuable court room experience. Following the annual meeting, a special board meeting was held to conduct a vote on the 2019 GCMCP leadership. 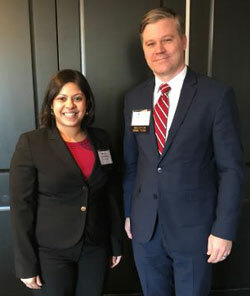 Matt Whitlow will be the Chair and Pramila Kamath will be the Vice Chair for 2019. Photos from the meeting and the following reception can be viewed here.